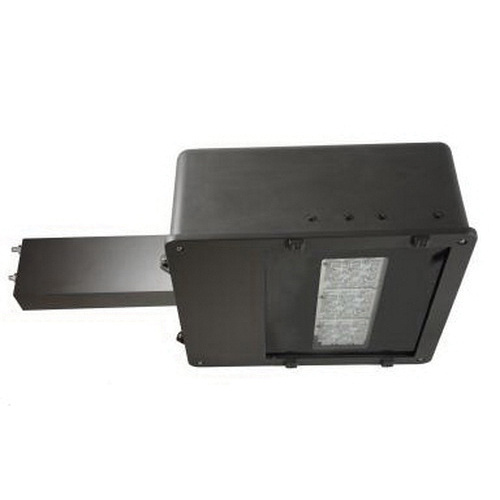 MaxLite LED large area light has a fixture power rating of 70-Watts and voltage rating from 120 to 277-Volts. It outputs 5220-Lumens of uniform color consistency light with a color temperature of 5000K and >=66 CRI. It has an average life of 100000 Hours. It delivers light in type V beam angle. The arm mountable fixture in bronze finish, has aluminum construction for strength and durability. This IP65 rated light has a power factor of 0.99/0.92. It replaces 400-Watt lamp. It includes 6-Inch extruded aluminum arm. The light meets cETLus, LM79 and LM80 standards.